Gabi, who once lived in Kamakura ! Click on my name to read more. Thanks, Cor, for taking this up !! 1. The tree grew as a soliter, therefore its crown was symmetrical and straight trunk with regular branches in its upper part. 2. A high quality soil and climatic conditions allowed very qualitative development of the tree. For the tree stability and nutrition uptake is root system very important. 3. We supposed that the surrounding area of the tree was of grass type, or stony pavement respectively. The tree growth conditions were optimal. 4. 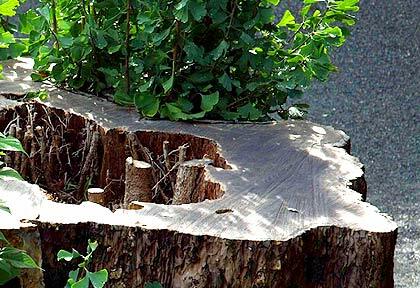 In regard to the severe damage of root system of the tree (video presentation), the hole in the main tree trunk and dead roots as well as very narrow level (10-15-20 cm) of healthy surrounding wood, we supposed that the reason of such damage has been the covering of the soil by firm concrete level (150-200 years ago). 5. The reinforcement of soil surface under tree and its broader surrounding has significantly changed the ecological conditions for tree optimal growth. The roots without sufficient access of moisture, air, high temperate under reinforce surface during summer caused progressive and long-term rotten and dead of the roots (in the Middle Europe the fungus Armillaria mellea Vahl. Is causing the roots rotten). 6. The roots rotten did widespread into tree wood. Within the tree was created a big hole of average of 1.5 m and continued till the height 2-3.5 m. The main roots which are responsible for the tree static and stability has become dead. On the video was possible to see dead sidelong branches. 7. 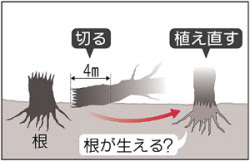 Repeatedly we underline the primary cause of tree trunk crash, the significant decay and, big hole in tree trunk (The Mainichi Daily News), dead roots and only very small undamaged part of trunk. Unexpected ginkgo’s crush has been supported by a strong wind. 8. The expectant rescue of historically precious 1000 years old tree unfortunately is not real. We can only minimize the loss of such precious tree by germplasm reproduction of Ginkgo biloba, by inoculation on others ginkgo’s trees, by micropropagation in vitro. In the case of male tree, generative reproduction in not possible. 9. Obtained knowledge originates from long-term wood research in urban conditions of Slovak Republic and from scientific activities at the Slovak University of Agriculture in Nitra. 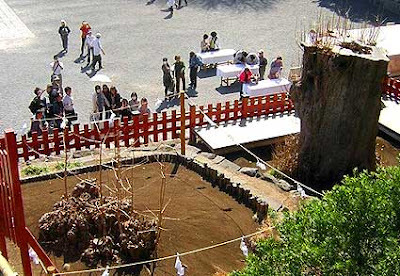 Shrine trying various methods to regenerate uprooted ginkgo tree. 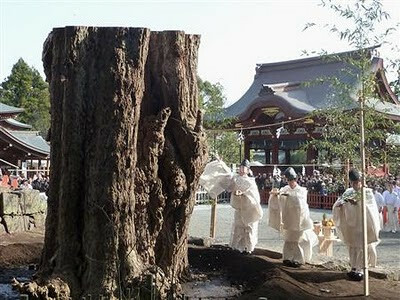 Tsurugaoka Hachimangu shrine is trying out three methods to regenerate the giant tree--a prefectural natural treasure said to be more than 1,000 years old--but it remains doubtful whether they will succeed. Firstly, the 6.8-meter-diameter trunk of the sacred tree was cut at a point four meters above ground. 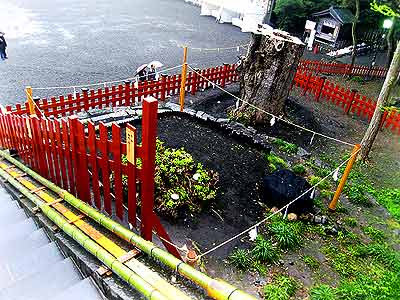 The lower section was transplanted to a new plot inside the shrine's grounds in the hope it will grow new roots. Worshippers got their first glimpse of this transplanted tree on March 16--less than a week after it was felled on March 10. The shrine has pinned its highest hopes on this method succeeding. 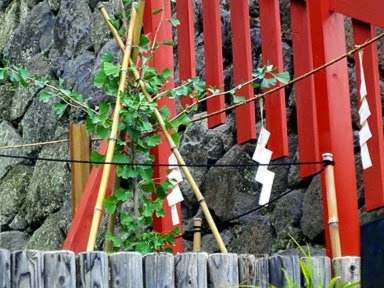 Atsushi Hashimoto, a priest at the shrine, said the shrine held a ritual for buds to shoot last Thursday. "As there are thin roots left around the base of the tree, there's a 90 percent chance [this method] will work," Prof. Chikayasu Hamano of Tokyo University of Agriculture said. "We'll do everything we can [to save the tree]." Hamano also proposed alternative methods of regenerating the tree. One way is to wait for the shoots to naturally ratoon from the stub on the ground. This method would enable the shoots to grow thick. Another way is to make cuttings from the upper sections of the uprooted tree. The Kanagawa Prefectural Natural Environment Conservation Center made about 400 cuttings from the branches. They are soaked in root stimulator, and grown in a greenhouse until they develop roots. They are then taken to a field, where they are expected to grow to a height of about one meter. "The branches of the ginkgo tree most definitely have the genes of the tree," said Hiroshi Saito, the center's chief researcher. "By growing cuttings, we can almost certainly create a clone seedling to return to the shrine." Kentaro Nakamura, a chief researcher of Sumitomo Forestry Co.'s Tsukuba Research Institute, said even a tree more than 1,000 years old can be revived through such means. He said that the cuttings have the highest chance of success, followed by the possibility of shoots ratooning from the stub. The least likely scenario is the tree being regenerated from the transplanted stump. A similar case can be found with the regeneration of a cherry tree estimated to be 550 years old in Onomachi, Fukushima Prefecture. 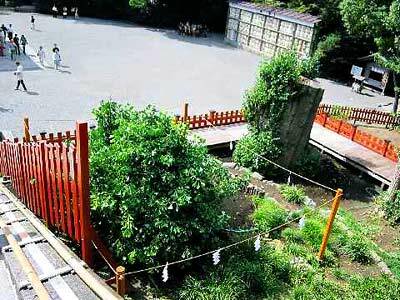 The town's natural treasure cherry tree, known as Kannon-zakura, was uprooted by a typhoon in 2007. The cuttings did not grow well, and the trunk was cut into pieces for disposal. In May 2008, however, a local resident found a shoot growing from the abandoned trunk. The Fukushima Prefectural Forestry Research Center grew 17 seedlings from the shoot, one of which has grown to a height of 76 centimeters in a greenhouse. The shoot absorbed water, was soaked in root stimulator and planted in soil with good water retention. Kept in humid conditions in the greenhouse, the seedlings took root about 30 days later. 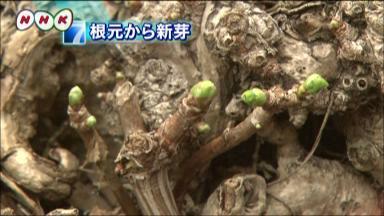 "Growing roots is the hardest thing," said Jiro Watababe, a researcher at the center. "We took the greatest care to prevent water vaporizing. 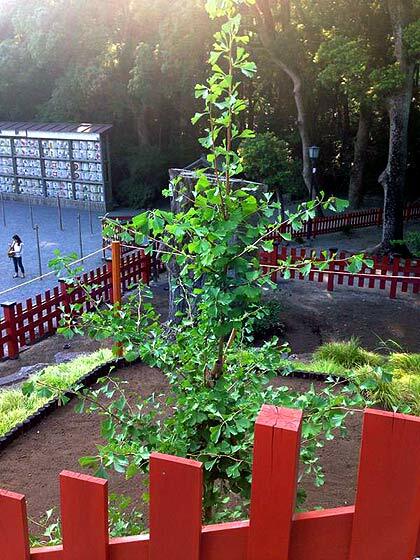 "Ginkgo trees are relatively easy to grow," Watababe added. "[The uprooted tree] still has roots, and its trunk has sufficient nutrients because it had yet to sprout for spring. I believe it highly likely it will regenerate." Váza Webové stránky o Ginkgo su velmi zaujímavé sledujem všetky aktuality o Ginkgo poškodení víchrica v Japonsku.Pošleme hľa Správy o našom výskum Na Slovensku. Vyjadrujte potešením, že STROM Ginkgo v Kamakura, Japonsko, ožíva na časť kmeňa začali 2.4.2010 pučať Nové listy.Koreňová Pňov výmladnosť Ginkgo JE vysoká AJ na Slovensku, v meste Trenčín vyrástli v roku 2008 a 2009 Nové výhonky (10-20 cm), vhodné na odrezku vegetatívny Premnoženie (vok Ginkgo 90 rokov). Video na stránku je hodnotné! What kind of methods are used in order to find out the age of Ginkgo biloba? The historical records about the tree planting, age estimation, Pressler screwer etc. Fascinating story of reverence for a tree. Thanks to Pavel for the assessment. Does anyone have access to hi-res pictures of the fallen tree? I will pay for good ones of the stump sprouts, and the fenced-off fallen tree. Whenever we visited Kamakura, we made a special effort to observe the renowned Hachiman Ginkgo. 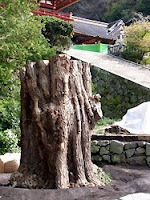 During the five years that I taught at Yokohama International School, my awareness of the uniqueness of the trunk of the tree grew. One day as I was studying it's sinuous character, I realized that the outer trunk was composed entirely of chi chi which had grown down the original trunk and had grown into a second outer trunk. The aerial growths had, over the centuries, fused together and, once they reached the ground, became roots, giving an additional support to the ancient tree. 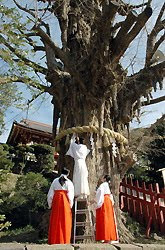 In photographs, one can see a few places where the descending chi chi had not quite completely covered the original trunk. I always wanted to generate a clone of the tree but, recognizing it as a sacred tree of the shrine, I did not want to commit the offense of procuring cuttings. Is anyone aware of a source of scions or rooted cuttings of this historic tree? After I learned of its demise, I E-mailed Porfessor Chikayasu Hamano of Tokyo University of Agriculture in an effort to acquire cuttings or propagules of the amazing Hachiman Ginkgo. I have no doubt that it's long- term life will be extended into future centuries through propagation strategies that are being undertaken. I sure would like a copy of my old Ginkgo Friend.